Story by Bjorn Bergeson, photos by Elliott Natz. Sanjay Talwani packs a video camera and a tripod into the back of his company SUV, pulls out onto Last Chance Gulch, and drives across Helena to Montana’s Museum. Within minutes of arriving, he’s taping a small throng of children slinging spears at cardboard cutouts of cartoon animals. It’s Native American Heritage Day, and Talwani’s here to produce a quick human-interest story for KXLH’s 5:30 p.m. news broadcast. He interviews the organizer of the event and then shoots 30 seconds worth of footage of the gigantic buffalo-skull sculpture resting against the front of the museum. The whole process takes him 30 minutes. Then Talwani packs his gear again and drives back across Helena. It’s 1:00 p.m. now. If he gets straight to editing, the package will be done with time to spare. 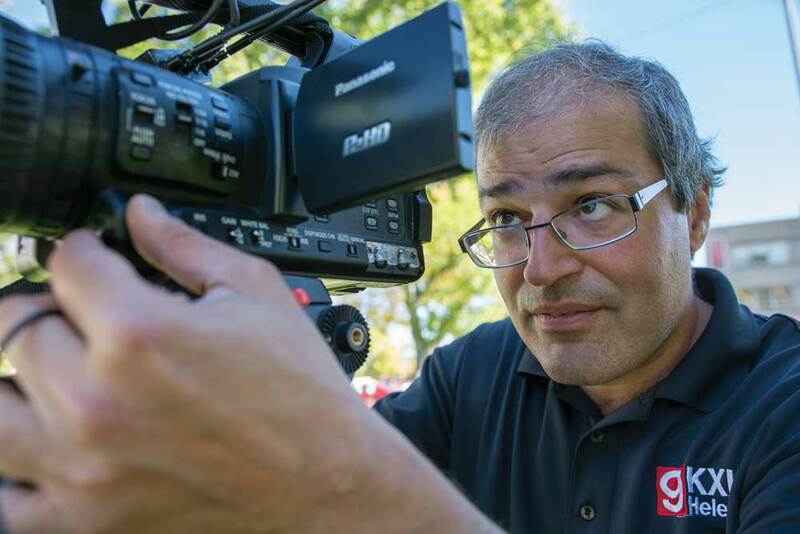 Talwani is one of a handful of Montana journalists who’ve shifted from newspaper to broadcast news, or vice versa, in recent years. Some took the leap out of sheer need for a job, while Talwani explains his move as a logical way to stay ahead of the competition. 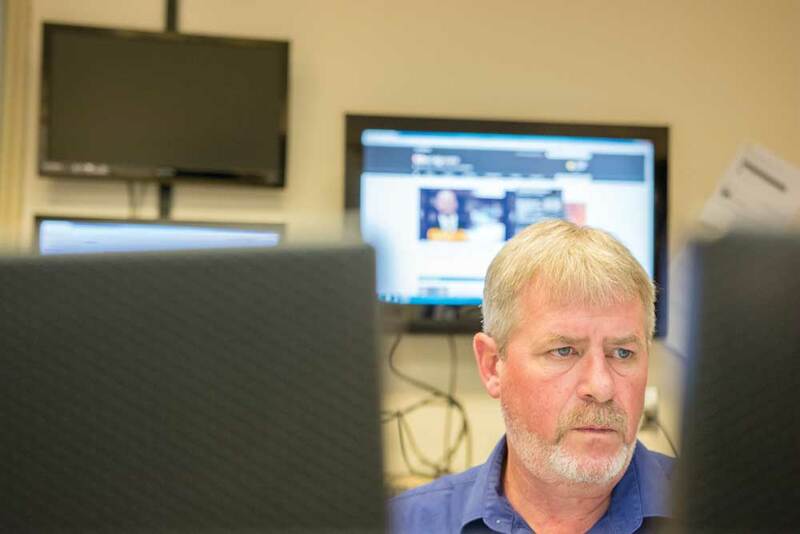 In the digital arena, both print and broadcast skills are in demand as television stations and newspapers in Montana invest in online platforms that tell the news through text as well as video. Faced with changing audiences and advertising flows, both companies and journalists struggle to stay relevant. The question is, are they treading water or pushing upstream? Sanjay Talwani looks at his camera’s video screen, prepping his camera for a short interview with the coordinator of Native American Heritage Day in Helena. It used to be that aspiring journalists could pick whichever field they felt strongest in. Those who wanted to be writers took print classes in college and went off to an internship at a newspaper, hoping to win a Pulitzer for a 5,000-word narrative. If they could take a decent photo on occasion it was considered a bonus, but not a requirement. That’s what the photographers were for. In the broadcast world, on the other hand, the spoken word reigned. A verbose script could make an anchor stumble on air. Reporters were taught to be brief and to the point, letting the footage do the talking. Correct AP Style wasn’t as important as getting the right angle for that wide shot. Broadcast and print were separate planets. When the Internet came about, it acted as a black hole, dragging the strengths of both mediums into it and exposing their weaknesses. Greg Tuttle plunged into that black hole. As a reporter, Tuttle spent 22 years working at papers in Washington, Las Vegas, and more. He covered the cops-and-courts beat for the Billings Gazette from 2001 to 2013 before landing a job as the online editor at KTVQ, more commonly known as Q2. The station saw an opportunity to hire a news professional who would improve its Internet presence and lend more weight to reporters’ stories. Originally, web operations at TV stations fell on the technicians and reporters themselves. Scripts taken from news broadcasts would be grafted onto the website with only the anchor’s voice commands removed. If the words were rewritten at all, they didn’t always conform to the rules of grammar or AP Style. At Q2 in Billings, Tuttle changed all that. He takes scripts submitted by reporters and edits them for clarity, transitions, and AP style. He handles all posting of content from the station to the webpage. He also manages the social media feeds for the station, updating Facebook pages and Twitter. When Tuttle moved from print to TV, Kyle Rickhoff had already migrated in the opposite direction. Rickhoff started working in television when he was 15. He never had much interest in becoming a journalist, and he still doesn’t consider himself to be one. When he was young, he says, he wanted to be a disc jockey, and he had a persistent mother. Early in his career, at KULR-8 in Billings, Rickhoff worked in the control room and edited commercials. Occasionally, when the newsroom was short-handed, he’d be sent out as a cameraman. In 2002, he moved over to Q2, where he worked as an editor, newscast director, trainer and online news content manager. In 2008, he left Q2 when the Gazette offered him more money and a change of pace. TV news airs four times a day, while the newspaper comes out once in the morning. But the online world has created a 24-hour news cycle where both sides compete on the same clock. Shortly after joining KXLH in October of 2013, Talwani broke a story about Montana Sen. John Walsh using his rank in the Montana National Guard to pressure other guardsman into donating money to the National Guard Association. “The first day it came out in Lee Enterprise papers, they were quoting MTN (Montana Television Network) stations,” he said with pride. 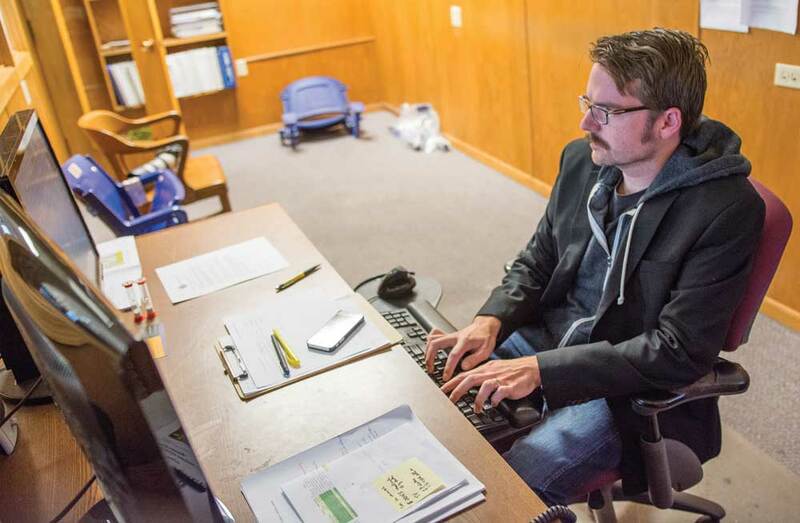 Kyle Rickhoff sits at his desk in his office next to the newsroom of the Billings Gazette. Rickhoff worked for Q2, a Billings television station, until 2008, when he became the online editor and then the digital media director for the Gazette in 2013. In the basement of the Missoulian newspaper, there’s a room slightly larger than a broom closet. A green sheet stretches across one wall haphazardly, while the others are lined with egg foam. Three soft-boxes provide all the light. There’s a camcorder on a tripod, and an iPad sits on a music stand. 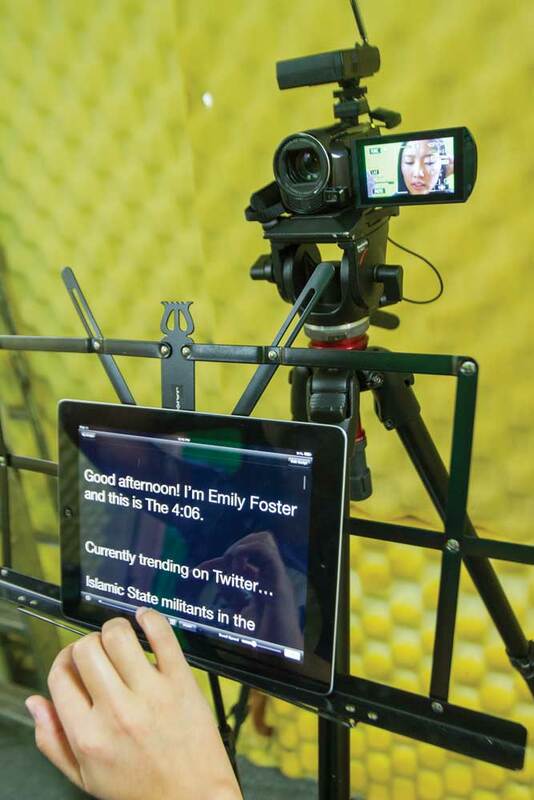 Foster belongs to a new generation of journalists who were trained to perform across platforms from the outset. After graduating from the University of Montana in 2012, she worked as a television reporter for KTMF Fox in Missoula. In August 2014, she was offered a position as the Missoulian’s digital director. The paper was looking to bolster its position in the competition for a younger audience. Since the mid-2000s, print has seen its advertising revenue shrink, forcing some papers to fold and others to initiate massive layoffs. To remain relevant, newspapers increased web presence, but showing the flag online didn’t directly translate to greater revenues. Many papers offered content for free at first, which made it hard to implement paywalls later, as audiences didn’t want to pay for what they’d already been getting. According to the Newspaper Association of America, digital advertising rose by 1.5 percent in 2013, while print advertising dropped by 8.6 percent. The picture looked only slightly better than 2012, when newspapers gained $1 for every $15 lost. “We call it ‘digital dimes’ to ‘analogue dollars,’” said Steve Outing, an independent media consultant and former print journalist who founded the Digital Test Kitchen in Boulder, Colorado. Compared to the nation’s newspapers, television stations are in better financial shape. Not only do they show more growth in online advertising revenue, there’s also been a rebound in local television news viewership recently. Moreover, TV stations reported record profits in 2012, in large part due to revenue from campaign ads after the U.S. Supreme Court’s Citizen’s United ruling, which allowed unlimited spending on those ads. The windfall made TV stations look like a good investment to many companies. In 2013, across the country, 290 local stations changed hands for a total of $8.8 billion, according to the Pew Research Journalism Project. In Montana, the Fox stations previously owned by Max Media were bought by Cowles Publishing, a company based in Spokane. The sale resulted in more money being pumped into KTMF Fox, Foster’s former employer. “We’ve hired new talent, new anchors, we’re launching a morning show,” Damon Callisto, KTMF’s digital manager, said. When Foster moved from KTMF to the Missoulian, the paper had been attempting a daily newscast for its website for several months. The idea was to be on the air one hour before the TV news shows. The 4:06, a five-minute short, featured newspaper reporters green-screened into a static shot of the Missoula skyline. The reporters were obviously nervous and the video quality was negligible. Since taking over The 4:06, Foster has brought in a new design, giving the show a fresh background and slicker graphics. The new graphics add more time to the editing process, but the end result looks better than before Foster came on board. On this particular day, the show consists of a quick rundown of five headlines from around the state, ranging from a violent crime to a woman who grabbed two kids and stuck them in her car to get them away from a black bear. Instead of field reporting, most days Foster can be found behind her desk, writing the script for The 4:06, working on web content and ad placement. “I’ve always been interested in the business and advertising side of things and this gave me the opportunity to explore that,” she said. Greg Tuttle sits behind computer screens at his desk in the Q2 newsroom. 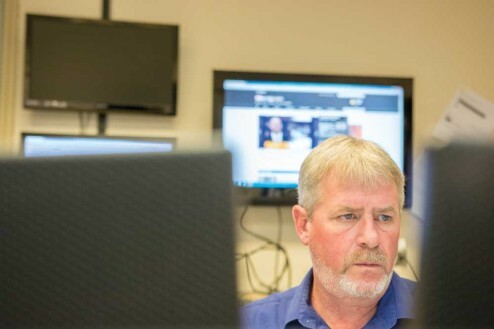 Aside from writing AP style scripts, Tuttle also surfs the web, watching what other media outlets are posting as well as monitoring his own online articles. The comparatively healthy state of the television industry conceals a worrisome trend. While audience numbers remain steady overall, the viewership is getting older. Newspapers as well as television stations struggle to do just that. Outing said part of the problem is that traditional audiences still read the paper and watch TV. To grab the younger demographics requires news outlets to change their tone and style, which could alienate the very people keeping them alive at the moment. The failure to capitalize on the move to digital pushes stations and papers to produce more exclusive content for their websites. Some of these efforts have fallen flat, like the attempt by the Billings Gazette to produce a local music webcast. It was a novel idea, but there wasn’t an audience for it. The Missoulian’s 4:06 show has improved since Foster took over, but the demographics are still out as to whether the changes have really impacted viewership. At the websites of local papers and TV stations, journalists rarely get to use the full range of their cross-media skills. The 4:06 is a recap of stories from around the state, not a showcase of exclusive, in-depth multimedia stories. Punishing deadlines make it hard for Talwani to add web-only content, and sometimes the nature of his assignments means there isn’t much to add. Nationwide, companies have cut staff and pay, while the workload of journalists has continued to grow. As stations and papers struggle with effective approaches to social media and websites, reporters hop from job to job. Emily Foster scrolls through the day’s content, rehearsing her lines before hitting record on the video camera. In this climate, journalists become transients and the Internet has turned into a refugee camp. A reporter from a newspaper may find herself being offered a position at a TV station managing content for the station’s website, or vice versa. But simply switching media formats isn’t synonymous with innovation. Talwani is a reporter who works hard to adapt, but remains traditional in his approach. “The reporting skills are the same,” he said. “Knowing what the story is. Setting up interviews. The basics. Those things are all the same.” His words can be read as a statement on the condition traditional media outlets are in. While they’re trying to adapt, reporters and editors are stuck in an industry model that is becoming less relevant by the day. Outing believes that the hope for traditional outlets lies in experimenting with new payment plans, and in more cooperation between the outlets. He cites the Guardian’s recent implementation of a membership program as an example for moving beyond a regular paywall, or subscription system. To convert online advertising dimes into dollars, news outlets will have to keep experimenting with different ad models and pay plans. One thing is for sure: The eyes that watch news programs on TV are getting older and will eventually burn out – in much the same way that fewer people read the news in a physical newspaper.